Four years. We’ve been in this house nearly four years now and I still haven’t wrapped my mind around the fact that I control this domain. That if there’s something about my kitchen that I don’t like, I can change that. It takes a long time to recover from renting someone else’s space, I suppose. But even when we owned before that, it was rental property–a place where you had to keep the neighborhood and type of property in mind with any work you did, so as not to outprice yourself on the market. A gourmet kitchen would not pay off in a 700-square foot apartment in the suburbs that carried a rent of about $750/month. But the house I live in now? Well… alright, it still has some limitations. It’s a late 50’s ranch in a neighborhood of the same on a small lot. The danger remains. Knowing this, I pick and choose to add where it counts and have learned that it’s the things I can take with me to my next house–because I know this won’t be my last–that satisfy me the most. That’s why it was so perfect when Wolf Gourmet contacted me to ask if I’d like to review their 10-piece cookware set! I’ve always wanted something Wolf Gourmet in my kitchen, but never really had a kitchen worthy of their top-of-the line appliances. Thanks to their cookware, I can easily integrate a touch of luxury to my life–and the kitchen I already have–without turning my world upside down. I jumped at the opportunity! I’ll admit, when the big box arrived, I unpacked the set, laid the pieces out on my photography table, and proceeded to stare at them… for a few days. They were weighty–solid–and felt fully capable of everything a kitchen with “helpful” kids and home cooks could throw at them. The polished stainless steel gleamed in the afternoon sunlight, reflecting the setting sun. Mesmerizing. They truly are beautiful… but more than that. Works of art, yes, but ready for action. I just had to get over the thought of soiling their perfection by using them for what they were made for. Thankfully, I managed just fine. 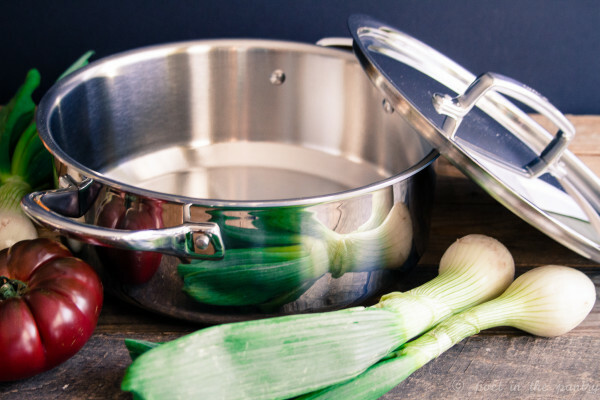 And while this covers our needs just fine–there rarely comes an occasion when I require a larger pot or pan–you can also purchase pieces individually to expand on this set. So maybe you need the 8 quart stock pot, too, for whipping up some homemade chicken stock or veggie broth? They have that! Or you need a skillet that’s somewhere between the 8.5″ and 11.5″? There’s a 10″ skillet, too, to bridge that gap. I love that you can get every piece you’ll ever need, right from Wolf Gourmet! A pretty face is great, but how does it all stack up? 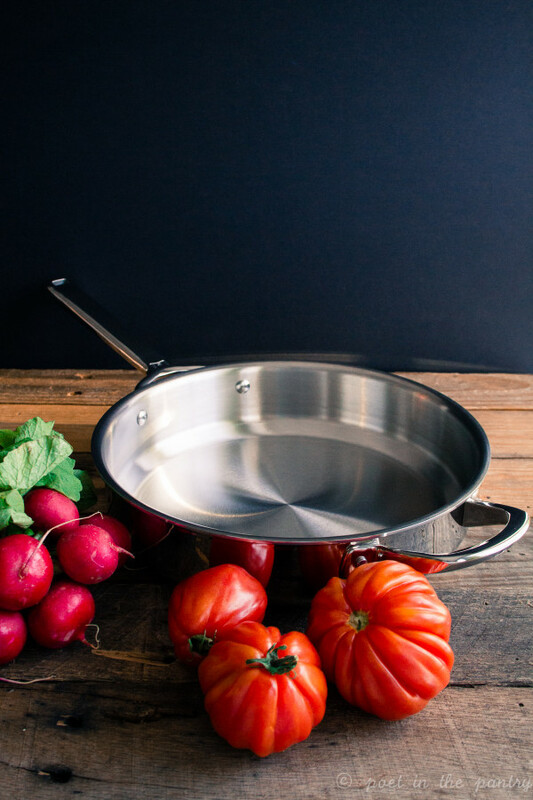 With their aluminum core surrounded by layers of pure aluminum and 18/10 stainless steel, these pots and pans mean business! You can use metal utensils–yay!!! because I love using my metal spatula (aka, pancake turner) when I’m cooking and can’t with other cookware I’ve owned! And the pieces are oven safe to 500 degrees Fahrenheit, which makes stovetop to oven cooking a cinch–and cuts down on the number of dishes to wash, too! Speaking of washing, yes, you can handwash your pretties… but what’s truly awesome is that the whole set is also dishwasher safe. DISHWASHER SAFE. Two of my favorite words in the English language. Ever since I got a dishwasher a few years ago, I have become the biggest fan ever of this device. And if something can go in the dishwasher, it’s more likely to be used in my kitchen than something that cannot. 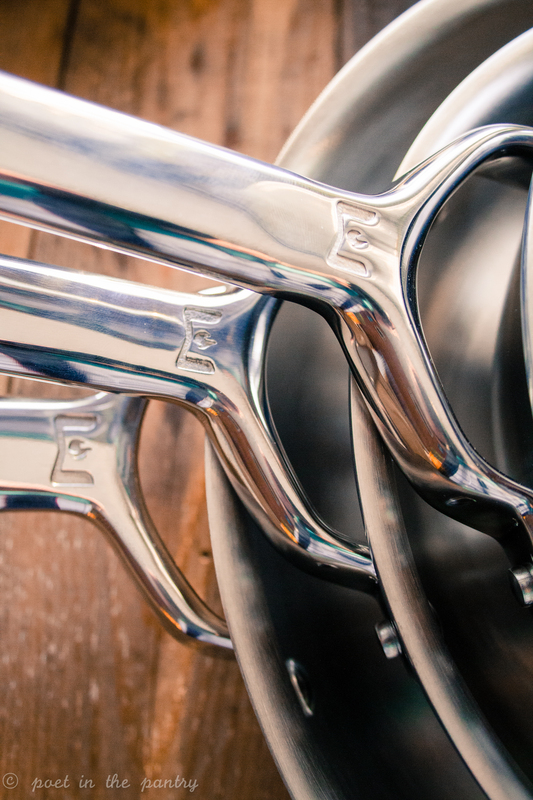 Can’t wait to get your hands on your own 10-piece cookware set from Wolf Gourmet? Bloomingdale’s is here to save the day! Find it on their website, where the set is in stock and ready to ship to your door! Or buy online and pick up at the store–it’s almost instantaneous! OR you can enter my giveaway below, because the folks at Wolf Gourmet have graciously offered up one 11.5″ skillet (a $259 retail value!) for one lucky reader to claim for his/her own kitchen! Could it be you? The 11.5″ skillet turned out to be my favorite piece in the set. Prior skillets I’ve owned were too small and I had a hard time cooking some of my favorite foods, like spinach. You know… spinach, which overflows with abundance when you add it to the pan… then disappears into almost nothing. Ha! Not only did I have enough room in this skillet to fit it all, but it was so easy to toss around, thanks to the flared sides. More food in the skillet means less I have to clean out of my cooktop later. Yes, I’m a messy cook. But I’ll happily hand in that crown with the better options I now have! The handle stayed cool to the touch (which is great because I’m clumsy as heck) and the helper handle on the side makes it easier to move the skillet to the table after cooking. No struggling with all the weight on one handle! So, speaking of that spinach, I bet you want to know what I made. Wolf Gourmet had me thinking elegance, elevating your experience, and enthusiasm for foods that may otherwise be quite basic. I love fresh spinach, and often just toss it with some olive oil and enjoy. But this time? I wanted a side dish that would make everyone feel just a little more special. It comes together in 6 minutes or less, but really makes an impression. The toasty walnuts, lemony spinach, and tangy, creamy goat cheese work together in a symphony of flavors just meant for each other. You can serve four as a side dish, or heartily enjoy it as a main for one to two. You have protein, right? It’s a complete meal. 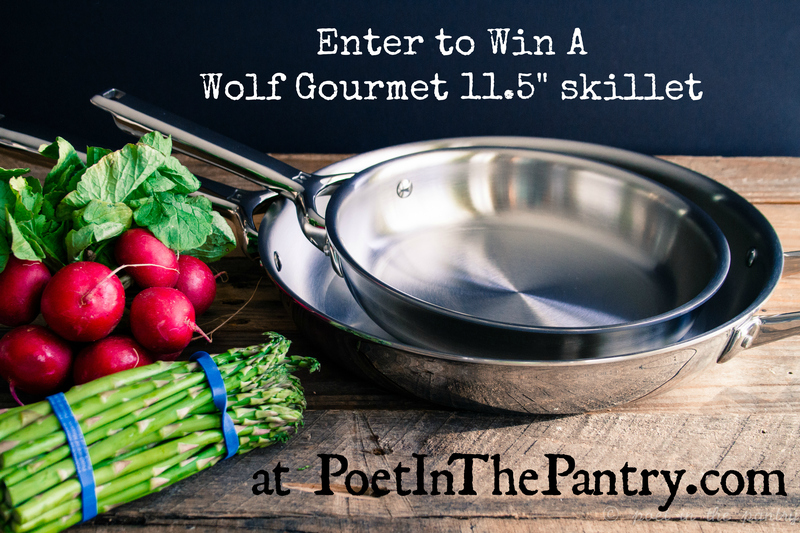 So, you want to win your own Wolf Gourmet 11.5″ skillet? Enter in the Rafflecopter widget below. This giveaway is sponsored by Wolf Gourmet. Giveaway is open to residents of the United States only. Void where prohibited. Entries must be received by 11:59PM Eastern Time on April 13, 2016, in order to be eligible. Winner will be chosen at random via the Rafflecopter widget and emailed upon completion of the contest period. Winner will have 24 hours to respond before another winner will be chosen. Full giveaway rules can be found here. Place an 11.5" skillet over medium heat and add the walnuts to the pan. Toss frequently until the walnuts begin to be fragrant. Add the olive oil and garlic and stir for 20-30 seconds. Add the spinach and lemon juice and toss to coat evenly, sauteing until the spinach wilts. Remove from heat, sprinkle goat cheese over the top, and serve immediately. I am in love with that whole set!!! I’d have to say, because I cook for about 5 people most days, I love the 3 1/2 quart saucepan and the 8 quart stockpot. 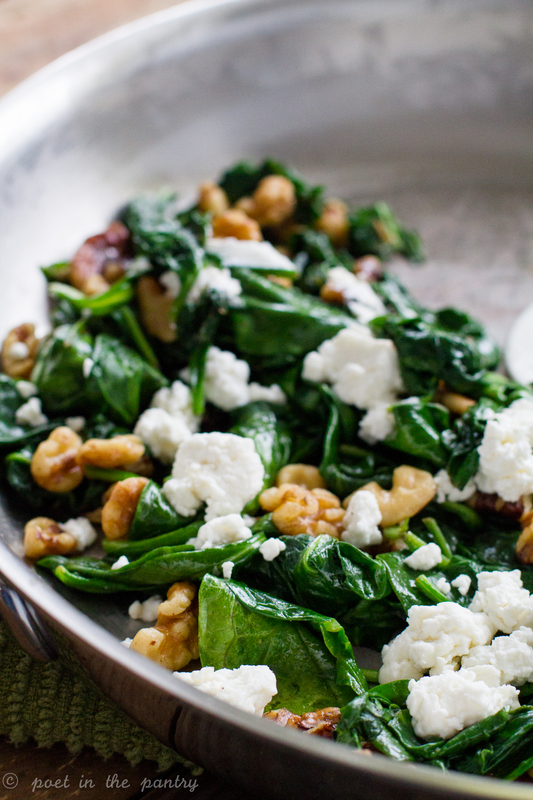 AND…this spinach looks AMAZING! Love the goat cheese and walnuts! Great photography of great products! The 8.5″ skillet, is my favorite since it is small and ideal for my use. Great photos! Your recipe sounds delicious. I’m thinking of adding some grilled chicken to it (and I haven’t eaten breakfast yet). The entire set looks devine but I would love to get my hands on the 8-quart stockpot with lid. With just my husband and myself – the stock pots that normally come with cookware sets are too big. This seems like the perfect size! I love a good stockpot! Love that set. I’d probably use the 8-quart stockpot the most. My favorite piece is the 3 quart saucepan with lid. 3.5-quart saute pan with lid ! i need that huge saucepan with the lid what a great pan to have !!! This would be a nice addition to my kitchen! Definitely the 8.5″ skillet, it’s an amazing set! Stockpots are always good to have for making soups and stews! I like the 10-piece set because it includes everthing I need. The smallest skillet will be the one I used most. The 8-Quart Stockpot with lid is my favorite! I can imagine all the soups, spaghetti, and everything I could make in it! I love the 8.5″ Skillet! I like them all but the 10″ skillet is sweet! The 8 quart stockpot would be used the most in my house. I love making homemade soups especially in fall and winter! The 8 qt. Stock Pot with lid is my favorite because I make a lot of homemade soups and pastas and that would give my food plenty of room! My favorite is the 8-quart stockpot with lid! The 8.5″ skillet by far. The 8.5″ skillet is my favorite! I love the whole set but the skillet looks awesome. I like the 10″ skillet best. My pick would be the 3.5 qt saute pan but it doesn’t look like you can go wrong with any of them! Absolutely gorgeous, Would love to own and that recipe looks so delicious. I will be trying it. This would be a nice edition to my kitchen. My favorite is the 8.5″ skillet. I like a small skillet. Recipe looks yummy would love to try in new skillet!! I could really use a new stockpot and this one is really high quality. I like the 8 quart stock pot. 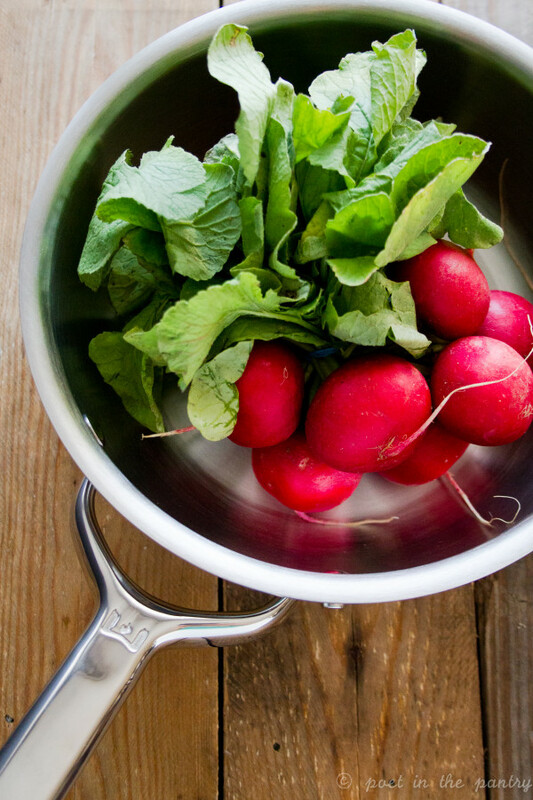 Wish we could get those beautiful veggies all year round. Would love the pans, and your recipes look like they are right up my alley. The 10″ skillet is such a versatile pan, I like that one. I love the 8-quart stockpot with lid! That would be great for making soups! Would love the 10″ skillet!!! Stockpots my favorite I like to make lots of soups. 3.5-quart saute pan with lid looks amazing! the whole set would be a dream to have! Those pots look fabulous! My pot test is how it handles rice. If it burns, I usually set it aside to boil water or something else. I would enter if my collection wasn’t so large and my schedule is such that I barely ever cook these days. Yes! The rice test is an excellent test! It’s been so long since I’ve made it stovetop (I have a rice cooker) that I’ve forgotten about that! I would absolutely love to own the 10″ Skillet! I regularly make spaghetti and meatballs and the skillet would be perfect! Also, not to mention the fact that it is so gorgeous! Thanks for the chance to win! Happy cooking! THe 10″ Skillet is my favorite piece in the set! Love the skillets because they are used so much at my home. My favorite is the 3.5-quart saute pan with lid because of its versatility. My favorite is the 8 quart stock pot with lid. I love it all, but, my favorite is the 8-quart stockpot with lid. I make a lot of sauces, stews, and pasta. The 10″ skillet is my favorite. Use that size most when cooking. My favorite is the 3.5 quart sauté pan with lid. The Wolf Gourmet Counter top Oven looks so sleek and professional. The wide design of the oven allows pans up to 9×13 inches. Maximum design for maximum efficiency. Like the 10 inch skillet! The stock pot is great too! The 10″ skillet is the one I”d use the most! Love this! If I have to choose one, I guess it’s the 3.5-quart saute pan with lid! Looks like the perfect size. The 8 quart stockpot would be used a lot in my kitchen. I make soups, stews, chili, and gumbo since it is easy to reheat for another day. With three teenagers, we are always on the go. One pot meals are fast and relatively easy to prepare. I Love the entire set but to answer your question my piece that I really like is the 8.5″ skillet, This would be wonderful for eggs and potatoes and bacon for morning breafast. 3.5-quart saute pan with lid, I never seem to have enough room in my pan for EVERYTHING! I like the 8-quart stockpot with lid because I boil a lot of chicken and other foods and this would be great. The 3-qt saucepan is my favorite, I can use it for everything! 3.5-quart saute pan with lid, though it was not an easy choice. I do love a good saute pan/with lid. As to the recipe, I’m allergic to walnuts. It looks like a winner for those who aren’t. The whole set is great but the 10″ skillet would be my favorite. The 8.5″ Skillet is my favorite piece in the set. I really like the 10″ skillet. 3 qt. stockpot would be the one I use the most and probably my favorite because of that! I love you site, your recipes look amazing. Sometime you go to a site for a sweeps and it is boring and treacherous, but you site is a welcome change. Love it!! Hard choice, but I like the 8-quart stock pot the most. I feel like it would be very versatile. Love the 8-quart stockpot the most. My favorite is the 3.5-quart saute pan with lid. The 10″ skillet is my favorite! The whole set looks awesome but I will choose the stock pot!! 8 quart stockpot – I make a lot of soups and stews. I can always use one of this quality and frankly, they are beautiful pieces. I’d have to say the 8 quart stockpot. You will never run out of things to make it that! I would have to say the 8-quart stockpot with lid beings as I love to make a good soup or stew. Also great for making my sauce for pasta. I love the stockpot. I do a lot of freezer cooking and that would really come in handy! I need a new 8.5 skillet so it is my favorite. My favorite piece is the 10″ skillet. Awesome skillet. Can’t wait to have one. 8-quart stockpot with lid. I love to make big one pot meals! The 3.5-quart saute pan with lid Is perfect for the skillet dinners I make. The food on this post looks really delicious. Would prob use the 2 quart saucepan with lid the most so that would be my favorite one. My favorite piece is the 3-quart saucepan with the lid because I am in need of a new one! 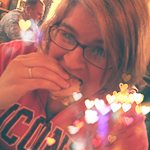 Maybe shouldn’t have visited this site on an empty stomach…. 🙂 Really makes my mouth water. The 3.5-quart saute pan with lid is a handy size. We don’t have anything like it, and my husband (who does all our cooking) would appreciate it. Ah, the entire set is simply divine. Love the 10″ pan! My absolute favorite after carefully contemplating would have to be the 10″ skillet. It is a staple and the most used in our kitchen. This set would be gorgeous on my stovetop and would adore using it daily! 8.5″ skillet……my hubby is always looking for a big skillet. I love the 10 inch skillet with the lid. I need more big skillets with the lid. My favorite of the 10 piece set is the 8-quart stockpot with lid. I would be able to use it for stews and chili. I like the 10 inch skillet. The 8qt stock pot really caught my eye!! It retails for $999.99 at Bloomingdale’s (link is in the post). An investment–yes–but it should last a lifetime! I really like the size of the Saute pan. It’s a really versatile size. 8-quart stockpot always need a good one of those. My favorite piece is the Dutch Oven. I can see a lot of future dishes made out of that piece alone. 10-Piece Cookware Set would be a fabulous addition to my kitchen. I like to teach cooking after a career as a home economist in the public schools. I love the 8 qt stock pot, Oh the soups I could make in that! The 10″ skillet is my favorite because I use a skillet everyday and this is the perfect size. My favorite is the 10 inch skillet. The gleam from that awesome Dutch Oven is equal to the gleam in my eye. The 10″ skillet is my favorite piece in the Wolf Gourmet set. This is such a nice set! I love the 8 quart stock pot and would probably use that the most! Who couldn’t love the 8-quart stockpot with lid to cook all those great recipes on poetinthepantry.com site? Wishing on a star for this cookware! That would be a really nice win! My go to pan has buckled! Oh, no! See! You need a new one! I love the whole set – beautiful and functional – but especially would use the 8.5 skillet. Thanks. I would love to have a full set. My favorite is the 3 quart saucepan w/ lid. My favorite is the 8.5″ skillet. I like the whole set but my favorite would be the 10″ skillet and the 8 quart stock pot.Great giveaway!! The 2-quart saucepan with lid would be my go-to piece for everyday cooking. The beveled walls that reduce the risks of burning and sticking will improve my day because cleaning pots and pans without ruining them is a challenge. And let’s be honest, the worst part of cooking is the clean-up. Anything to make that easier is a plus in my book! I make a lot of soups so the 8 quart stockpot with lid would be my favorite piece. The 2 quart saucepan with lid is my favorite. The 3-quart saucepan with lid. Cheers for the giveaway! The salad is making my mouth water, The pans would be a great addition for me. The entire set is lovely, but I would have to choose the 3.5-quart saute pan with lid. If I had to choose just one, it would be the 3.5-quart saute pan with lid. But of course, I want the whole set. (And I could use a new stove, by the way.) Your recipe is my kind of food! My favorite would be the 10″ frying pan because I would use it the most. P.S. the stock pot is my fave! What a great piece of cook ware. I absolutely love the 8.5″ skillet! 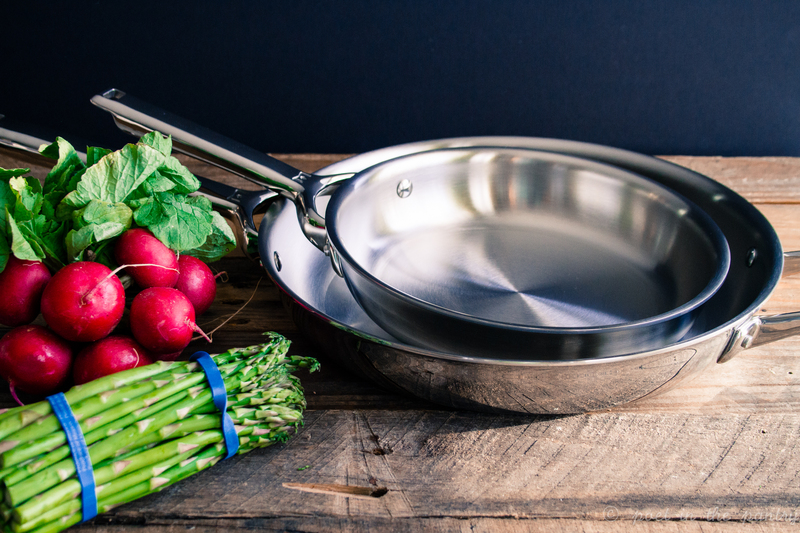 The 3.5-quart saute pan with lid or the 10″ skillet! Thank you Wolf Gourmet for a chance to win the wonderful 11.5″ skillet! I love that is also dishwasher safe too. I like the 8 qt stockpot best. The 3.5-quart saute pan with lid is my favorite. Love the whole set! never heard of Wolf gourmet brand, like to win one to see it. I like the 10″ skillet. The 10″ Skillet would be perfect for us! We tend to use the bigger pans more. Love the whole set! My favorite would be the 11.5 skillet. That is my go to pan the most! I love the whole set, but if I had to choose just one piece, I’d choose the 10″ skillet because I could use it every day. I think the 3.5-quart saute pan with lid would be terribly useful! My favorite is the 3-quart saucepan with lid. 10-inch skillet looks nice and roomy. I like a roomy skillet. My favorite in the set is the 8.5″ skillet because it is so versatile. It can be used to fry chicken, make a stew, braise beef and many more things. That whole set is amazing, I am starting to regret my decision to buy my current non stick coating stuff. The entire set is amazing, but I think the 8.5″ skillet is amazing! Most of the time, I am just cooking for my daughter and myself, since my husband works out of town most of the time. It would be perfect for us! The stockpot is my favorite, I make a lot of pasta and that would be perfect for it. I’m looking most forward to the 8-quart stockpot with lid!! I never seem to have a pan big enough to cook the amount of food I cook sometimes! Thanks for the wonderful giveaway!! I love the 10″ skillet so I can make plenty for my big family. Looks like an amazing, high quality set. I would love this. I think the most used piece in my kitchen would be the 10″ skillett. I cook a lot of veggies and this size would be perfect for my family. Thanks for the awesome giveaway! I love the stockpot the best! Beautiful photos and the recipe looks fantastic! Love the cookware! Before I commented, I printed off that recipe for the spinach salad. Looks yummy! Always looking for great new recipes and this looks delicious. The 3-quart covered saucepan is a perfect in-between size that I need. Cheers, and thanks! I can always use a 3 quart saucepan with lid. This set looks amazing. The 10″ skillet is my favorite. The 10″ skillet is my favorite in the set. The ten inch skillet is my favorite part! I can cook almost everything in that! I love the stockpot for making lots of soups! I love all the pieces, but I’d have to say the 8 QT stock pot — we are really big on soups, stews, and shellfish! Love the whole set, the skillet is my favorite. Gorgeous. I like the 3 quart saucepan with lid. This set looks like it would be fun to cook with. The 10″ fry pan is my favorite because I would use it almost every day! Oooh that food looks delicious! Looking forward to trying the recipe! The 3 quart saucepan is my favorite, because it is the one pan I use most. I like the 3-quart saucepan with lid. I love the 8 quart stock pot–we love soups and with a growing family they eat bigger amounts of soup. I like the 3-quart saucepan! Love the Echo Cyprus Comforter set. I like the stockpot, i like to cook in quantity and make soups and stews! my favorite is the 3.5-quart saute pan with lid, my present pan came from the thrift store but it didn’t have a lid–so I guess i need to “put a lid on it”! My favorite piece in the set is the 10″ skillet, definitely. I would love to have the 8 qt. stock pot to make soups and sauces in. I cook large quantities and freeze for later use. I like the saute pan with lid. I just love the whole set. I would never leave the kitchen if I owned this set. I love the 10″ skillet. The whole set is so nice, but I’d have to say the 10″ skillet would be my favorite piece. The 8 quart stock pot is awesome! I would love to own the beautiful stockpot. My favorite is the 10 inch skillet. I would love this large pan to cook my favorites in. I love the 3.5-quart saute pan with lid. It’s a good size for a one-pot meal, is oven safe, but it’s small enough that it won’t weigh a ton when I try to lift it or wash it. Favorite would be the 8.5″ skillet, it would be good to cook scramble eggs. Firstly, this dish looks delicious. 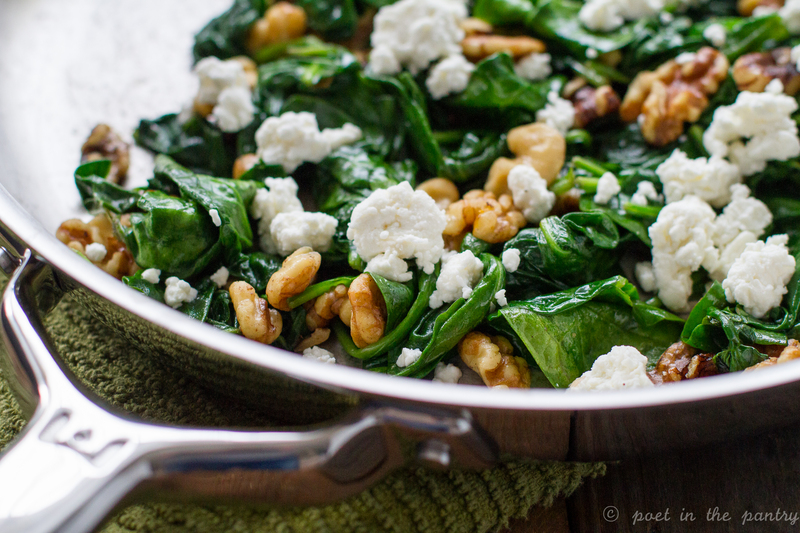 I love anything involving spinach and love the added cheese and walnuts! Such a great way to bring the spinach to life! I would absolutely love the 8-Quart Stockpot With Lid! So perfect! I love the entire set, but I like the 10″ skillet, the best. I really like the 8.5″ skillet. I could get a lot of use out of it. The 3.5 quart sauté pan with lid is my favorite piece in the set. 8-quart stockpot with lid looks very useful – I often cook for a big crowd. Love the wilted salad!!! The sautée pan! I’ve been trying to make more veggies and stir fry for dinner and this looks great. My favorite is the 8-quart stockpot with lid. Would love to have the set since I cook for several people. Like the 6 quart stock pot. I love the 3-quart saucepan with lid! I can make enough soup to last a while! The 10″ skillet is my favorite because I’d use it the most! Your salad looks so delicious! I love the 8 quart stockpot. I love making soups and stews, so this is my favorite piece in the set. The stockpot! I love making soups and sauces- especially my world famous home made marinara sauce! My favorite is the 8 qt stockpot with lid, but they all are great. I am most excited to add the 2-quart saucepan with lid. Thanks for the giveaway! I like the 3.5 qt Saute pan with lid. 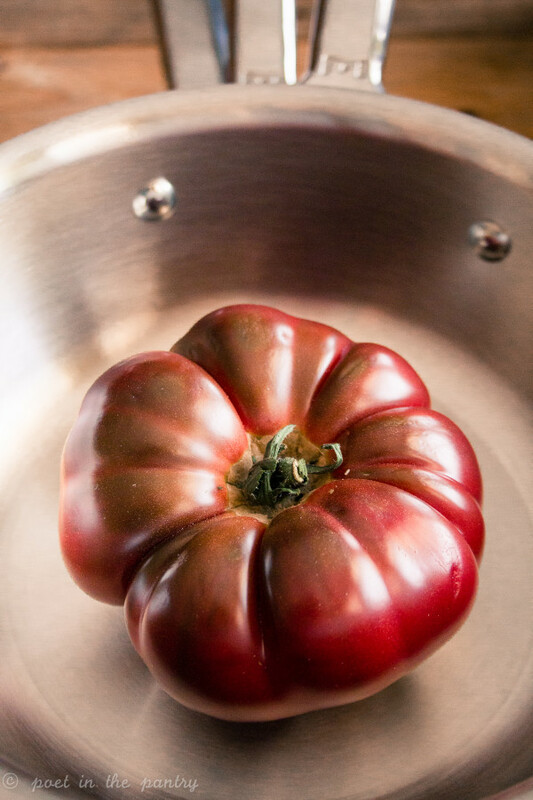 The 10 inch skillet is just about the perfect size! Recipe looks delish! Add a baked chicken breast and dinner is served. I’d love to have the 10″ skillet! 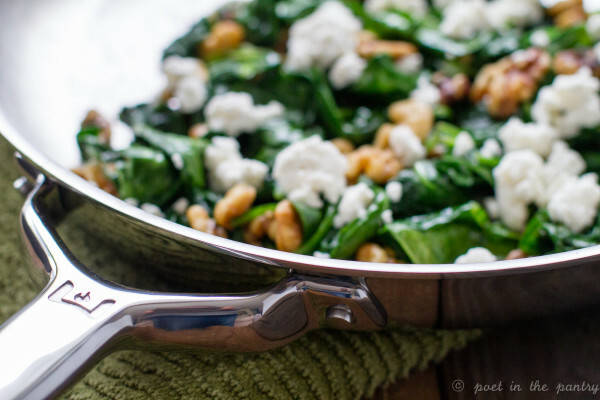 The Wilted Spinach with Walnuts is very yummy and what a better way to fix it in than the great Wolf gourmet cookware! I am in my late 60’s,but this would make cooking easier and healthier. Thanks for a chance to win this fine set. I really love the 10 inch skillet and the 8-quart stockpot with its own lid. Thanks for the giveaway. Ohhh, I would love to use the 8-quart stockpot with lid since I make a lot of my own soups and stocks for recipes. We make a lot of soups so Im excited for the 8-quart stockpot with lid. I would love to win the 10 inch skillet, since I use that size the most. Sometimes I need more than one at the same time! That 8 quart stock pot is calling my name. I honestly would love any of them! 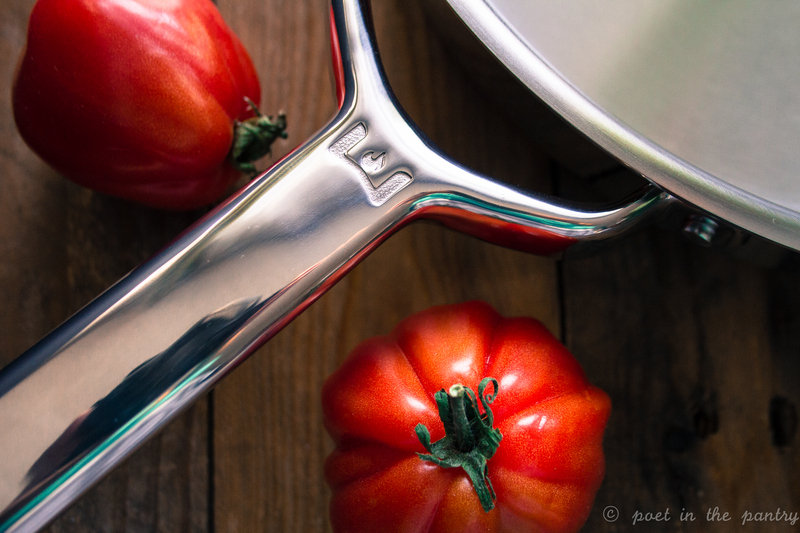 I am a foodie and good cookware is essential to craete delicious results! I so would love to win this and hope to! Thanks for sharing this gorgeous post with gorgeous pics and a well written review! Good luck to all! I need to make this yummy looking warm salad right away! I really need a new stockpot. I would love the 8 qt stock pot. I love making stocks and soups. The 8-quart stockpot with lid is my favorite piece from the set. I really like the 3.5-quart saute pan with lid. It’s something that we would use a lot! I’m a sautue-r over achiever. I burn things. Help not burn things with this pan. Thanks and good day. 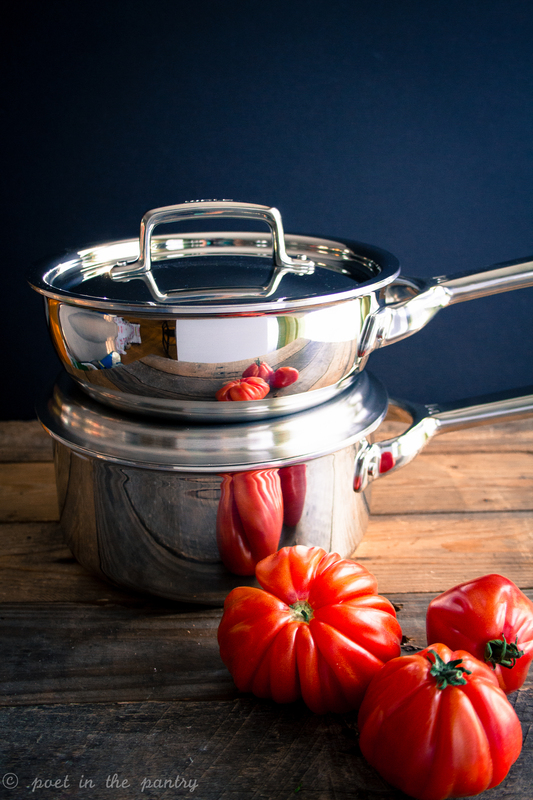 My favorite is the 8 qt stockpot….love to make soups and stews. The stockpot looks great! I don’t’ have anything nearly that large.